In a CollectionView, some cells should have an additional subview or layer. The CollectionView can be told to resize it's cells, thus all content needs to resize appropriately. Currently, the cell is initialized from a nib containing a cell with imageview; the cell nib is linked to a custom UICollectionViewCell subclass, that only does the init. Autoresize subviews is checked. The CollectionView is told to resize the cell by a value derived and returned in sizeForItemAtIndexPath:. I have subclassed a FlowLayout but it only specifies ScrollDirection and Insets. All of that is working fine. Problem: How do I add subview/layer to the cell so it also resizes correctly? I tried adding subviews and layers with translatesAutoresizingMaskIntoConstraints off, but these do not automatically change size at all. Also tried to use code frame/view instead of nib. The best I got now is a cell.contentView.layer sublayer which I add in cellForItemAtIndexPath:; that is "manually" resized by storing the cell's frame.size from sizeForItemAtIndexPath:, which is not only ugly but also ends up with the sublayer having various sizes for different cells. I had the same problem. Switching between two layouts did not resize the Pictures (UIImage) inside my cells. My Cells where build without a xib. And I used two different cell classes for each CollectionViewCustomLayout. I have inspected the UICollectionViewCell and I found that there is a view between the cell and the contentView, and that view has intrinsic width and height constraints. Instead of the AutoresizingMask I'm just updating as below and seems working for me. how could I forget this... Thanks! 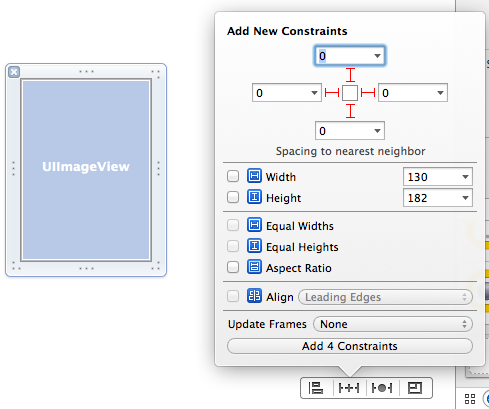 This worked to fix all of my custom collection view layouts that had problens with Xcode 6. I ran into the same issue just now. When using the UICollectionViewFlowLayoutDelegate method to set the cell size depending on device and device-orientation, the size would be calculated properly but subviews would not resize to fill the newly size cell. The effect was a large blank cell with small subviews that don't fill the cell's bounds / remain the size equal to their current value in the xib file. Prior to doing this, the contentView mask was nil. This one is simple and actually works! Thank you. This problem appeared on iOS 7 devices once I started building with Xcode 6 GM, and adding this to all my collection cell subclasses fixed it. Thank you, Alfie! The same problem with iOS 7 devices when I started building with XCode 6 GM. Same thing happens here and you save my life. By the way, is it a bug of iOS or what's the root cause for this? Wow, there's no way I would have figured this out. I could not get a label to span the full width of a collectionView cell in Xcode 6 with the iOS7 sim. It worked fine in the iOS8 sim. I added the above awakeFromNib function to my collectionView cell subclass (which was otherwise almost completely empty) and now both the iOS7 and iOS 8 simulators properly layout the cell views. Huge thanks! thanks so much alfie, I was getting constraints conflicts until your code fixed it! Should be the accepted answer ! You saved me working hours !! Fixed an issue migrating from Xcode 6 (iOS 7) to 7 (iOS 9). A simple auto layout solution is to set constraints to the container view. So if we have an image view with a parent view, we basically want to tell the subview (the image view) to maintain a leading, trailing, bottom, and top space distance of 0 to the container view. Didn't work for me. iOS 7, XCode 6. Best solution ever. Works for iOS 9.3, Xcode 8. I always prefer autolayout when possible. But Sometimes usings frames and bounds just is a timesaver when a view is determined straightforward by only its superview. But when I had different sizes of cells in the collectionView it messed up things and the image sometimes took the size of a different cell. So I turned to working with the the cells bounds and - ye that acually worked out fine. So maybe give that a try? by setting autoresizing mask it worked great! Doesn't setting translatesAutoresizingMaskIntoConstraints to NO mean that it will ignore the autoresizingMask? I'm under the impression that under-the-hood there is no such thing at non-autolayout, just autolayout which mimics the old/alternative way. The solution was to turn off AutoConstraints for the cell xib and activate the flexible width/height arrows in the AutoResize for the imageviews.